Samsung Tvs | Reviews and products | What Hi-Fi? Samsung’s new screen makes its excellent direct backlight technology more affordable. Samsung’s impressive QLED TV is a significant step forward for the technology. Samsung has produced another quality QLED at a size that OLED doesn't touch. Lacking next-gen features, but this little TV has a great deal going for it. Bank balance won’t stretch to a big-screen OLED? The MU7000 could be a solution. Does Samsung’s first QLED TV of 2017 live up to the hype? Best 60in+ TV, Awards 2015. 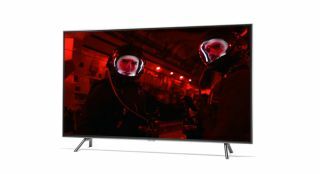 If you're after big-screen thrills, this 4K TV won't let you down. Samsung's 4K TVs had great success last year, but can the new UE65JU7000 continue the trend? Best 60in+ TV, Awards 2014. A great 4K performance that doesn’t forget the importance of other resolutions. This is an excellent all-rounder. Cheap? Yep. Cheerful? Most definitely.